Synopsis: Five years ago… Tia fell into obsessive love with a man she could never have. When she became pregnant, Nathan disappeared, and she gave up their baby for adoption. Caroline reluctantly adopted a baby to please her husband. Now she’s questioning whether she’s cut out for the role of wife and mother. Juliette considered her life ideal: solid marriage, two beautiful sons, and a thriving business. Then she discovered Nathan’s affair. He promised he’d never stray again, and she trusted him. 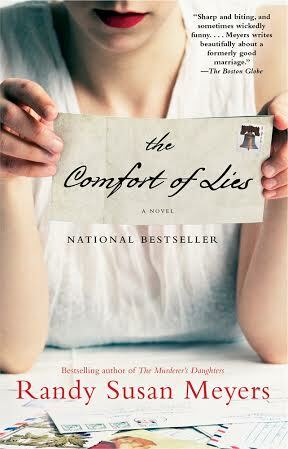 My take: The Comfort of Lies is a story about the fall-out from an affair between a married father of two and the 24 years old woman who worked for him. When she conceives he ends the affair and confesses to his wife. The story really becomes one of how the affair affects many people: Nathan’s family, Tia – the young woman, the adoptive couple, and Savannah – the child. This is one of those books that is impossible not to become emotionally invested. Meyers’ characters are so well-wrought that it was easy for me to feel at least a bit of sympathy for most. Written from the various characters’ POV the reader learns details that flesh out each character. This story is not just about the affair. Each character grapples with issues that readers will connect with to some degree. I’ve thought about this novel quite a bit since finishing – one of my signs of a good book. I liked it and think it would be a great choice for book clubs. There’s a readers guide included.